Orakelkortlek på engelska med 53 kort och guidebok. 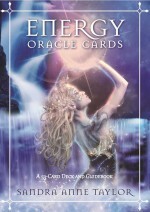 These easy-to-use cards will help you to understand what your consciousness is creating, as well as reveal any hidden blocks that may be delaying your progress. The information they bring will empower and inspire you, for it comes from heavenly messengers, friends from the spirit realm and your own higher self. All that you need is available to you, so let your intuition soar. Listen to the messages it brings and take your life to wonderful new heights!